BMW showed off the 2016 M4 GTS at the Amelia Concourse, much to the amazement of attendees. The car appeared alongside some of the world’s most famous classic cars, including a few made by BMW. The M4 GTS is way more than just an M4 with a more powerful engine. BMW revamped the entire design, reducing the car’s curb weight, increasing its power, and even increasing its fuel efficiency. A sleek and bold new body kit give the car a unique appearance. The hood is reinforced with carbon-fiber plastic, and comes with an adjustable front splitter. Aluminum also contributes to the reduced weight of the car. BMW reports that its DIN curb weight is just 3,329 pounds, a whole 200 pounds lighter than the standard M4. The inside of the new M4 GTS is also different from the old model. The new model lacks a rear bench seat, which was replaced with a glass-fiber reinforced plastic panel. Above the panel is an Acid Orange roll cage built from high-strength steel, sporting colors to match the Alcantara-wrapped steering wheel and dashboard. The GTS logo is also easy to spot throughout the design of the car. The Acid Orange wheels give the car a distinctive look. They are made from aluminum and measure 19 inches in the front, and 20 inches in the back. The car’s engine is the real kicker, however. It has a 3.0 liter M TwinPower inline 6-cylinder engine, which can reach up to 493 horsepower and 443 lb-ft of torque. BMW says the car can reach speeds of up to 189.5 miles per hour, and has a 0-60 time of roughly 3.5 seconds. 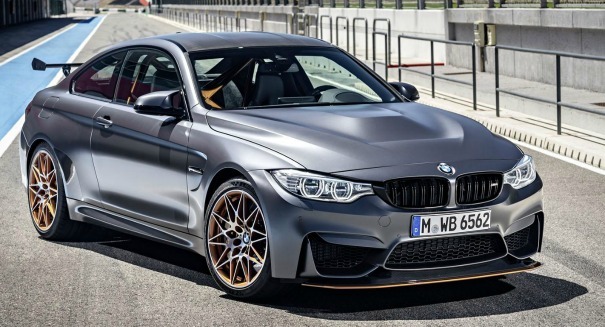 A news release from BMW describing the new M4 GTS can be found here.